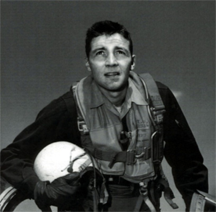 Col. John Boyd, U.S. Air Force, in a photo taken during his time as a fighter pilot. When he was an instructor at the US Air Force's Weapons School (then called the Fighter Weapons School), he had a standing offer of forty dollars to any pilot who could prevent his reversing a position of extreme disadvantage within forty seconds in an air duel. He never lost. This earned him the nickname "Forty-Second Boyd." Photo courtesy Hill Air Force Base. In the past decade or two, a model of decision-making originally developed for aerial combat has found application in the business world. It's called OODA, which is an acronym for its four main elements: Observe, Orient, Decide, and Act. In the model, when people make decisions, they move around a loop. They first observe the situation. Then they orient themselves to it, analyzing its essential features. Next, they decide what to do. Finally, they act, and the cycle repeats. The model was developed by Colonel John Boyd, who served in the US Army Air Corps and later in the US Air Force as a fighter pilot and military strategist. He flew a short tour as a wingman in the Korean War, though he never fired his guns or claimed a kill. After the war, as an instructor at the US Air Force Weapons School, he headed the Academic Section and wrote the school's tactics manual. He subsequently developed the OODA model. In the first Gulf War, he was very influential in the design of the attack on Iraq and the invasion of Kuwait. We sense the environment using whatever means and sensors are available. Speed, accuracy and focus are essential. Example: A corporation's senior management team learns of a hostile takeover attempt by a private equity firm. Orientation is the synthesis of images, views, and impressions of the world as we understand it, influenced by experience, tradition, and the evolving situation. Example: Senior management learns whatever it can about the private equity firm, the structure of the offer, and the defenses available. Given our understanding of the environment, we create a set of possible responses and select one. Example: Senior management decides to approach a competitor about a merger or acquisition. The final step of the loop is carrying out the decision. Execution might fail, but whether it succeeds or fails, we return to the beginning of the loop for the next cycle. Example: The corporation and its competitor agree to merge, and make a public announcement to that effect. for all rapidly changing situations application to combat, OODA is invaluable in decision-making for all rapidly changing situations, such as marketing, sports, emergency management, finance, public relations, national politics, and workplace politics. In rapidly changing situations, success depends on cycling through your OODA Loop rapidly enough. In situations that involve one or more opponents, success depends on cycling through your own OODA Loop more rapidly than your opponents cycle through theirs. When your opponent — or the situation — changes too fast for you to cycle through your OODA Loop, you can't keep up, and failure almost certainly follows. When you can cycle through your OODA Loop more rapidly than your opponents can cycle through theirs, you can seize and hold the initiative, and we say that you're "inside your opponent's OODA Loop." For more about Col. John Boyd, read the biography, Boyd: The Fighter Pilot Who Changed the Art of War , by Robert Coram. Order from Amazon.com. Col. Boyd's contributions to planning the first Gulf War are especially fascinating. Would you like to see your comments posted here? rbrenpqUmTtzKlacaFxihner@ChacCXLaQdXFQswXYfhioCanyon.comSend me your comments by email, or by Web form. We often describe someone who arrogantly breezes through life with swagger and evident disregard for others as having a "big ego." Maybe so. And maybe not. Let's have a closer look. Although the OODA Model model was originally developed by Col. John Boyd for applications in aerial combat, it has proved powerful and general enough to have other military applications. Indeed, it is truly useful in any contention-driven situation, including marketing, organizational politics, and natural disasters. My program, "Managing in Fluid Environments," explores how to apply this model in situations where changes come along at such a rapid rate that the next change comes along before we reach the "New Status Quo" of the changes we're already dealing with. More about this program. My program, "Changing How We Change: The Essence of Agility," focuses more intently on applications of the OODA model in a wide variety of situations at work, from the perspective of organizational agility. This point of view is especially valuable to people in organizations that use agile product development processes. By applying the OODA Model, the Satir Change Model, and more recent developments from group psychology, we can substantially enhance an organization's ability to adapt to changing circumstances, and to transform itself to more competitive stances. More about this program. Are you planning an offsite or retreat for your organization? Or a conference for your professional society? My programs are fresh, original, and loaded with concrete tips that make an immediate difference. rbrenWNJshtztaTtLLseNner@ChacOJBTgQdmjKKoqteuoCanyon.comContact me to discuss possibilities. I offer email and telephone coaching at both corporate and individual rates. Contact Rick for details at rbrenxWxgMLZleZkZUcLRner@ChacTjsoaCsvMzttCDfuoCanyon.com or (650) 787-6475, or toll-free in the continental US at (866) 378-5470.